Apple Sold 30,000 iPhones An Hour Last Quarter, Scored Record Profits : All Tech Considered The tech giant sold 74 million phones in three months. 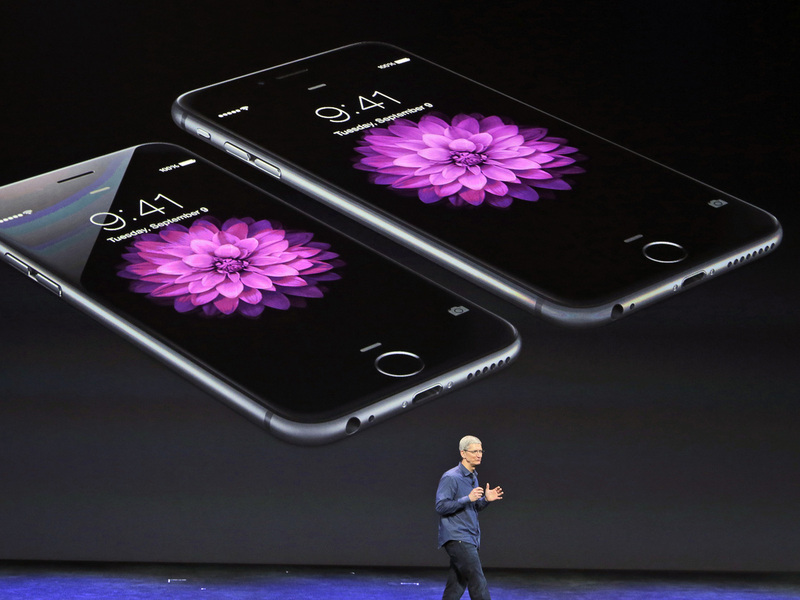 Apple CEO Tim Cook discusses the iPhone 6 and iPhone 6 Plus late last year. Sales of Apple's larger iPhone 6 and 6 Plus hit one out of the ballpark last quarter, reports NPR's Laura Sydell. "Apple sold over 74 million iPhones in three months and it made $18 billion in profits — that's a record for the company. Apple CEO Tim Cook said that they sold 30,000 iPhones every hour. "The sales may reflect pent-up consumer demand — many people were waiting for Apple to release a phone with a bigger screen, which its main competitor, Samsung, already had. "Apple also got a boost from China, where sales were up 70 percent. Last year Apple made a deal with China Mobile, the country's largest mobile provider." Cook also announced that Apple would release its much anticipated smart watch in April, Laura reports. The company's CFO, Luca Maestri, told Reuters that growth in China and other developing markets was robust and expected to continue. "Maestri said he does not expect Apple to struggle because of China's slipping economic growth. 'We haven't seen a slowdown,' he added. Maestri also said the company doubled iPhone sales in Singapore and Brazil. Apple will reach 40 company stores in greater China by mid-2016, Maestri told analysts on a conference call." The company's quarterly revenues set a record and were more than 10 percent higher than analysts' expectations, CNBC notes. A previous version of this story incorrectly said Apple's last quarterly profit was $18 million. It was actually $18 billion.